In a previous post, I had likened the bizarre 3dcg anime gdgd Fairies to an Adult Swim cartoon. I still think it’s an apt comparison, and with the new season currently running this only renews my confidence in that description, but what I hadn’t expected was for there to be another anime like gdgd Fairies, especially not one that’s themed around a giant robot future. This isn’t so surprising once you learn that it’s from the same creator as gdgd Fairies, but what’s impressive is that in some ways this new show’s humor is even more absurd. Straight Title Robot Anime (yes, that’s the title) takes place in a time when humanity has gone extinct and only giant robots are left to fight an eternal war. Living on this Earth are three human-sized female robots who are trying to stop the war by re-discovering mankind’s great invention: humor. In order to accomplish this, they try to figure out what it means to tell a joke and induce laughter, but the concept is so foreign to them that they’re unable to make any headway. In other words, this anime is actually all about trying to explain jokes, which is classically regarded as humor’s own kryptonite, but amazingly this just makes the whole premise funnier. It’s also animated entirely in the free program Miku Miku Dance, which was created for just the purpose its name implies (animating Hatsune Miku). If it wasn’t obvious that this show is from the same mind as gdgd Fairies from, the fact that there’s an “improv” section similar to the fairies’ own “Magical Spring Dubbing Lake” should be more than sufficient evidence. In it, the three robots visit simulations of “ancient human locations,” such as a hardware store, and try to figure out uses for the objects found. 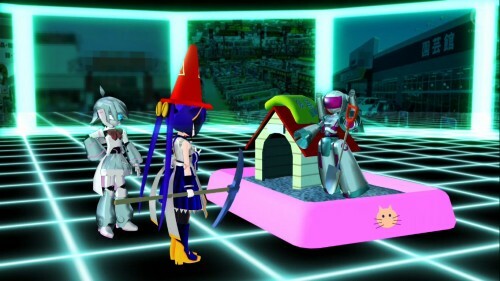 I’m not sure how they accomplish these scenes, but I imagine it actually involves them gathering materials from those real-world places and then having the voice actors engage in prop comedy. Here, not only are the voice actors unable to keep up their acted roles and break down into their normal voices, but one character goes from having a very artificial BEEP BOOP I AM A ROBOT voice to having a natural cadence which not even an electronic voice distortion can fully hide. So that’s Straight Title Robot Anime. In my opinion, the humor isn’t quite to the level of gdgd Fairies yet, but its appeal is such that if you liked gdgd Fairies you’ll probably enjoy this too. However, if your only response to the fairies was revulsion then this show won’t help either. These really are both love it or hate it shows, as is evident from the comments both anime received. You can experience Straight Title Robot Anime, gdgd Fairies 2, and the angry comments these shows tend to get, on Crunchyroll. This entry was posted in anime, bad humor, fandom, giant robots, review and tagged gdgd fairies, gdgd fairies 2, straight title robot anime. Bookmark the permalink. well, anime is so good at that, maybe this could work? Anime comedy – explaining jokes and girls hitting boys, mostly. This sounds like a wackier version of Fireball from the synopsis and Fireball was OK I suppose. This show reminds me of seeing stand-up acts at small night clubs. The performer is just throwing everything out there, not really taking note of what works and what doesn’t, then calling it a night until the next gig. You know what I would really enjoy? 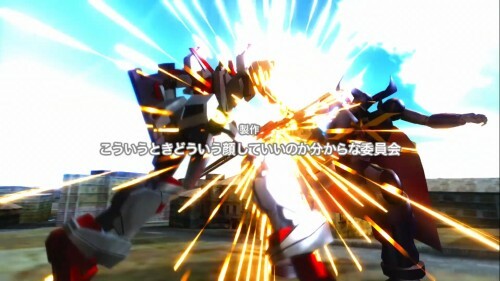 If they just used the mech combat sequences be the entire show. It’s actually pretty cool (maybe it just reminds me of MechWarrior). 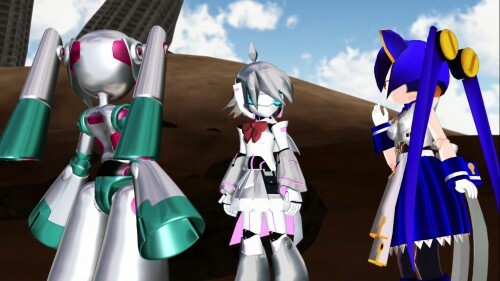 I think it might be funnier if there were some more interaction btw these 3 and some of the other mecha types and suits like SD Gundam and some of the mecha from ScrambleWars and SD Macross. That wold definitely draw in more fans.